Greeting Cards is rated 4.4 out of 5 by 18. We offer high-quality cardstocks, coatings, and inks. All the right options for rocking your greeting card printing. Size options shown represent the final folded size. "I use PrintPlace to print greeting cards that help us build relationships with our clients throughout the year. I love working with PrintPlace because I can turn an idea into a tangible marketing piece very quickly and inexpensively." Rated 5 out of 5 by Ladybird from Good quality Long time customer - 15+ years - always good quality! Rated 5 out of 5 by owpetcoff from Fantastic! I love these greeting cards. The quality is outstanding. Custom greeting cards are perfect for holiday cards, business or personal stationery, thank you notes, birthday cards or invitations. With quantities starting at 25, creating personalized greeting cards is fast, easy and affordable. With our easy ordering tool, you get to upload your own artwork and choose custom options to make the cards uniquely yours. Our print experts are happy to answer any questions you have, so don’t hesitate to give us a call. Note: Select “no folding” if you prefer your cards to score for folding but ship flat. Follow our greeting card layout templates to ensure that your artwork meets PrintPlace’s minimum design requirements. The layout templates come with two different format options: Illustrator and Photoshop. The guided instructions will give you the details for submitting your files. Let PrintPlace handle your card printing and mailing! Our direct mail services were designed to save you time and money. We can insert your greeting cards into envelopes, inkjet addresses, and mail them for you. postal presorting for automation rates. Note: Inserting can be added to either blank envelopes or custom printed envelopes by calling us. Personalized greeting cards are a nice gesture and a proven promotional item. They add a personal touch to staying in contact with customers or prospects. 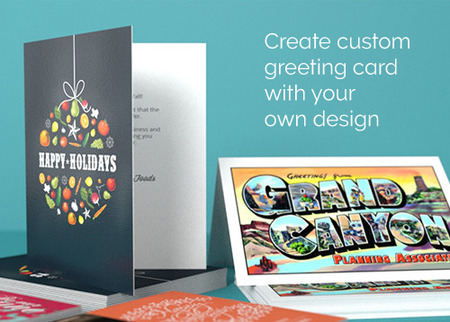 By printing greeting cards for holidays such as Christmas or New Year’s, you can make your business stand out. Of course, you can also promote an upcoming event or include a gift certificate or coupon at the same time. They are also perfect for personal stationery or thank you cards. Rather than using a generic card, make your message personal. You won’t be held back by boring designs because you can create your own photo or artwork and upload it to our cards.